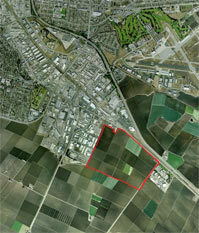 EMC Planning Group prepared a program-level EIR for a proposed 257-acre agricultural industrial business park for the City of Salinas. The proposed project requires the following City of Salinas entitlements/approvals: sphere of influence amendment, prezoning, annexation, general plan amendments, permanent zoning, specific plan adoption, subdivision, and site plan review. The project also requires the following approvals from the Monterey County Local Agency Formation Commission: sphere of influence amendment, detachment from the North County Fire Protection District, detachment from the Monterey County Resource Conservation District, annexation to the City of Salinas, and annexation to the Monterey Regional Water Pollution Control Agency. The subdivision includes extension of existing roads (Burton Avenue and Dayton Street) into the project site, and the creation of six parcels. Proposed uses within the specific plan area would include agricultural processing (preservation, processing, and distribution of agriculture products); agricultural manufacturing (design, manufacture, fabrication, assembly, maintenance and repair of tools, equipment, and vehicles used in growing, cultivating, harvesting, processing, packaging and transporting agricultural commodities and products); and agricultural support (research, design, development, testing, management, and sales). Other non-agricultural related commercial/retail/office businesses may be allowed within the 16.4 acres currently inside the city limits, as well as parcels for public facilities such as water wells and power substations. The environmental analysis focused on the following issues: loss of important farmland, air quality impacts (construction, operations direct and indirect), traffic and transportation, cultural resources, visual impacts, geology and soils, drainage and water quality issues, water demand, wastewater generation and treatment, and public services. In addition to preparation of the EIR, EMC Planning Group assisted the city staff with preparation of CEQA notices, CEQA findings, staff reports, and resolutions.